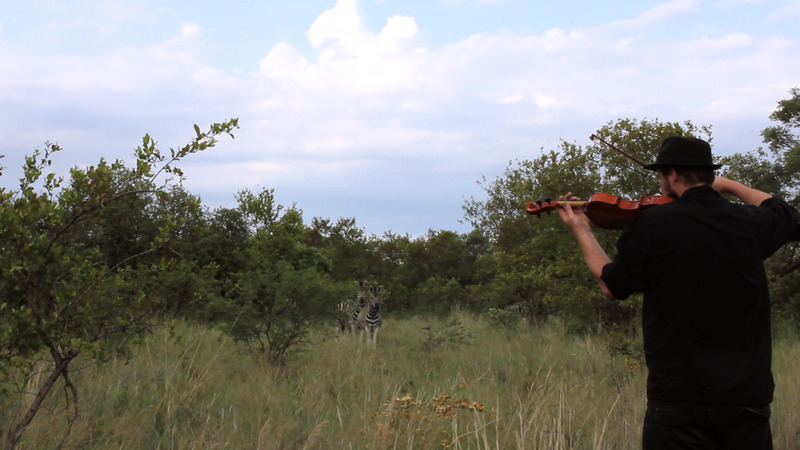 RECITAL The work was filmed in late December 2010 on a private game reserve in the Northern province in South Africa. It was largely unplanned and arose from my chance discovery of an old violin at a family member’s home a few days prior to the trip. 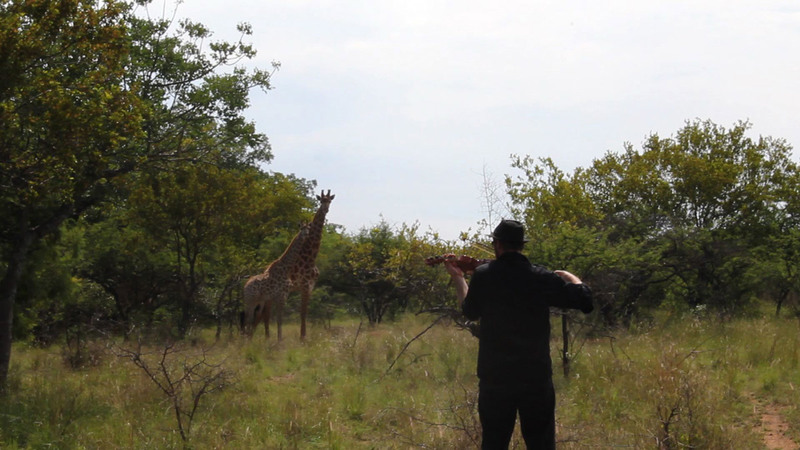 During the course of a number of days we travelled through the Highveld bush filming up to 30 individual sequences with various animals including Giraffe, Eland, Blue Wildebeest, Red Hartebeest, Kudu, Impala and Zebra, amongst others. The sequence from which the first image was taken best conveys the general tenor of the various encounters with these animals (approximately 40-50% of which yielded the same kind of result). The work could be considered a loose response to Bruce Nauman’s ‘Violin Tuned D.E.A.D.’ of 1968. In the original – filmed in his studio – Nauman stands with his back to the camera repetitively playing the notes DEAD. Initially I felt it could be interesting to redo the piece within the context of the contested South African landscape – including, but not limited to, the ongoing struggle for land as well as that of its ever-shrinking pool of natural resources. 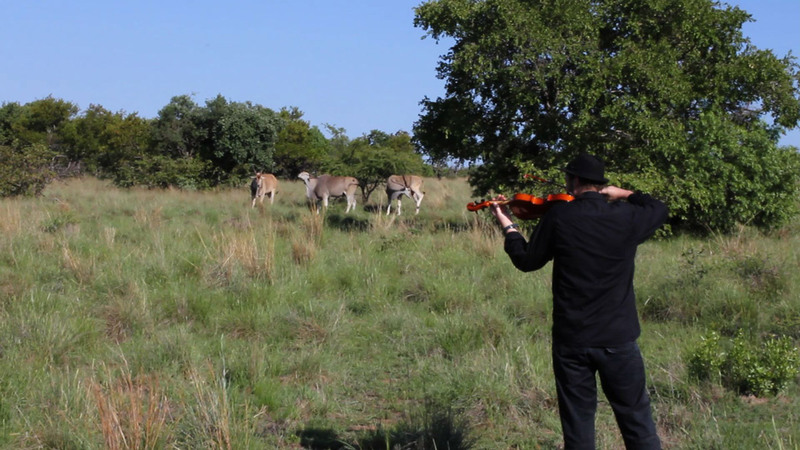 These natural resources would include here, not only the vast but dwindling supply of gold and other minerals, but also the diversity of fauna and flora for which South Africa is so well-known internationally. Of course stereotypes abound with the notion of a ‘wild Africa’ perhaps encapsulating something about the supposed beauty and savagery of African landscape and of the people that inhabit it. 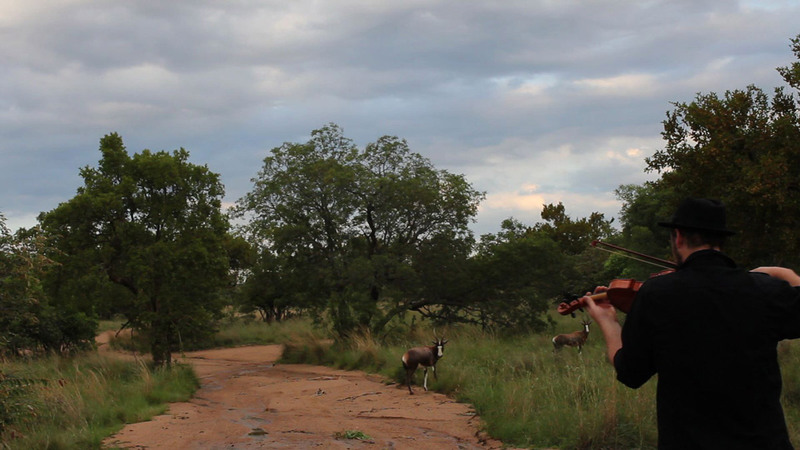 However, I continuously struggled with the tuning of the violin – a problem exacerbated by the poor condition of the instrument and the absence of any ‘proper’ musical referent. Even when I managed to get the instrument tuned it would not last for long. To cut a long story short, I soon felt the exercise a bit futile. In this way the work became something completely different, perhaps something more affirmative. Once I let go of the clear conceptual and formal structure I had initially envisioned, the piece became animated by the possibility of interaction through the combined, minimalist use of sound and gesture. One could perhaps say that the actual material problems that I encountered during the production of the work led me to a reconsideration of – or in keeping with the musical terminology, a flattening out of – the very basic, foundational structures that underpinned its otherwise conceptual origins. a process than a contained, final artwork.